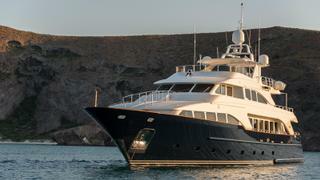 The 35.05 metre motor yacht Albatross, listed for sale by Antonio Yturbe Redo at Edmiston & Company, has been sold with Ken Denison at Denison Yachting introducing the buyer. Built in GRP by Italian yard Benetti to a design by Stefano Righini, Albatross was delivered in 2004 as a Benetti Classic 115 model with full refits in 2014 and 2017. Her interior by Francois Zuretti in light woods and neutral fabrics can accommodate up to ten guests in five cabins comprising a master suite, two VIP suites and two doubles. All guest cabins have entertainment centres, television screens and en-suite bathroom facilities, while a further three cabins sleep up to six crewmembers. Albatross has an elegant saloon featuring a selection of sofas, armchairs, gold curtains and mirror inserts. The dining area forward is intimate with a large table able to seat up to ten guests for gourmet meals, while between the lounge and dining area is a full wet bar and entertainment system. The aft deck is large and has a table and chairs seating ten guests for al fresco cocktails and dining, while a welcoming skylounge has an onyx-top and leather finished bar, comfortable sofas, a games table and a retractable plasma television screen. The panoramic sundeck features seating beneath a Bimini top, a barbecue, bar, fridge, Jacuzzi, a shower and sun loungers. Twin 1,350hp MTU diesel engines give her a maximum speed of 15 knots and a range of 3,200 nautical miles at 12 knots. She is also equipped with Koopnautic zero-speed stabilisers to eliminate rolling motion, both at sea and in port.